Again, not directional, not fashion-forward but very well done. Please scott offer some comment on the latest thom browne collection, it has got to be worthy of some debate. Great photo, Sart. Non-directional and non-fashion-forward are GOOD things, right? I couldn’t tell from your caption. This is such a classic photo, it’s hard to know where to begin. Check out the undarted sport jacket with a 3/2 roll, the crimson pocket square, dress shirt with university stripes, grey flannel trousers, and tobacco suede split-toe shoes. Exceedingly well done! Mr. Barbera is one of my style icons and I have a collection of images of him on my hard drive. I wish more men, especially the fashion victims and sofa slobs, would pay attention to him. Watch and learn. A spruced up Sean Connery, eh? This man is put together. Nicely done. The shirt, the shoes, the eyeglasses, the pants are just great. Beautiful and comfortable. Perfectly suited to the man. But, the jacket seems less-than-perfect to me. It looks like the stiching on the bottom half (near the lower pockets) of the jacket was done poorly. It appears to be wavy. I’d never expect a man such as Mr. Barbera to have poor tailoring. Could it possibly be an illusion in the photo? Scott – great picture and great look. I saw this up at A.S.W. a few days ago and immediately could tell is was your work. I miss seeing more of these stylish older men here – keep up the good work! My Grandpa is better than YOUR Grandpa. …if more people dressed like the man in your photo here the world would be a better place and not the cesspool sewer it has become and that is glamorized in fifth rate fashion magazines like GQ. I think GQ has done more damage than good. If women want men to dress better, the first thing they should do is give their man this picture and pictures like it and insist they do not buy GQ. He may not be fashion forward, but he has a definite sense of style. I have long admired Signore Barberra’s clothing. It’s nice to have a face to put with those fabulous clothes. Very nice as you said. I love the orange tinge of his eyeglass frames. Small but definitely adds to the palette. Mr. Barbera is class through and through. His appearance demonstrates how terrible some of the “fashion forward” stuff is. He looks like a professor and I want to be in his class. This man is absolutely gorgeous. I have been a widow for 10 years and I am ready to start dating again. That is why I learned how to use the internets. Where can I find him? he looks great – love his glasses, shirt and tie – very dapper! 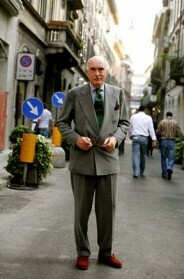 i love when older gentalmen rock the great style. and show us what they have learn over their lives. more truth to the fact that mens fashion doesn’t need to change, because classic will always be that, classic. I agree very well done, now if I can get my granddad to leave the house with a tie it’d be a miracle. In my opinion, Mr. Barbera is one of the best dressed individuals in the world. He is an example of classic style, and I love your features on classically dressed individuals. If “forward” means looking like Dr. Spock’s long lost daughter or Pee Wee Herman, then no, Mr. Barbera is not a representative of fashion-forward comic book looking characters. Yet, I cannot help but think that his sense of fashion is what will continue to be referenced in the future. This is the eternal standard of how elegant adult gentlemen dress. It is where the eternal meets reality. Classic J. Press, right down to the 1 3/4″ cuffs. How did this look end up in Milan? Bertie got it right. This is style, not fashion. And it is extremely well done. I want him to be my grandpa. Look at the break in his pants… Perfect! I’ve never seen Mr. Barbera himself, only his classic clothing. Here’s a guy and style that from the very first moment one can respect. And I’m kind of with “LBT for President” above: some of the guys you see decked in fashion-forward designer stuff come across as way too self-important. Nice photograph–my imagination tells me that it’s a wonderfully quiet street behind him. For some reason, the photo had me wondering if those are transition lenses. Anyway, style is a beautiful thing. What works for the goose doesn’t go for the gander, but it works nonetheless. And today, rarer than ever. To echo a common sentiment, I love Mr. Barbera’s style. I don’t want to knock anyone’s personal style, but I’m glad that there are still men like him protecting and perfecting the classic. It’s a great counterpoint to the more “fashion forward” and something I try to emulate myself. This man shows class all the way non of that noveau rich you can see from time to time. 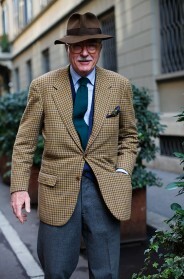 Mr Barbera is defently one of the biggest style icons in menswear, if I could I would prefer to wear his brand everyday.. I retract what I wrote about the understatedness of his dress. i just meant what someone already pointed out: the age of the jacket, the scuffs on the shoes, etc. I’d just think a guy like him could wear a new pair every day. But the outfit is great. Truly iconic, and I must agree with all the commenters about not being “fashion forward” being a good thing. Why should we go forward from this outfit. The buch should stop here. Erudite, sohisticated and charming. Men can learn a lot from this man. I just wish I could afford his line of clothing. He’s perfect. He makes it look so easy and effortless. A refreshing change after all those young guys who think that style means dressing unisexually. Everything about Barbera is absolutely perfect. It takes a while to understand the depth of his good taste. But one does get there with no regrets. This look ended up in Milan because there are men there who don’t want to look like gigolos,panders, or girls. This picture is why i love this blog. At his age i want the heart to dress like that!The smile, the glasses, the look, AH! VIVA Luciano Barbera! How sad that this great example of classic and deeply personal style could be considered anything but wonderful. I don’t think Scott meant anything negative by his observation. 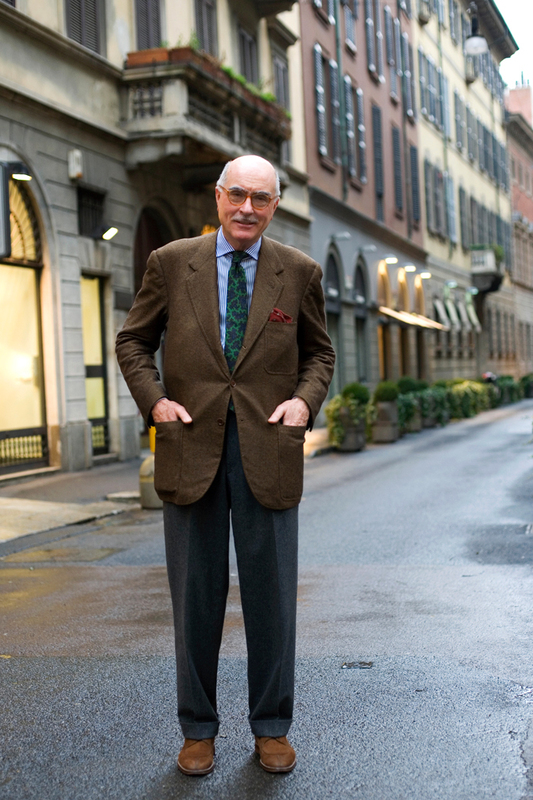 I mean, if I could sit down and talk style and menswear with anyone, it would very well be Luciano Barbera. The man is a legend. So, to my mind, there is no reason to add a qualifier to this picture; it’s perfect. I have nothing against more “fashion” looks and cutting edge whatever – but those looks always seem to fade and go out of fashion. I hope to have half as much class at that point in my life. Mr. Barbera’s look will outlive us all. Perhaps by including his qualifier, Sart simply was referring to the fact that his blog, in general, is usually geared toward the fashion-forward. This is an exception in that it’s not fashion forward, but so well done that it deserves a spot anyway. Doesn’t mean that Sart was finding fault, just that he was pointing out the difference between this and his other pictures. Personally, I think it’s very well-done and I would love to see more men like this where I am from. There are many subtle forces at play here. The perfect “X” of jacket creases, converging at the button. The absolutely symmetric way the pant creases swoop inward at the ankle. The lights in the vitrines. The wet pavement. The earth tones of the buildings. The flat grey sky. I get much more satisfaction out of the way I dress than I would wearing YSL or D&G any day. I adore everything about Mr. Barbera’s appearance. Once again it´s the way he wears these classic items – completely at home with them!